Stratocaster Guitar and Controller, STC-Shaped Guitar from Squier in the Stratocaster series. 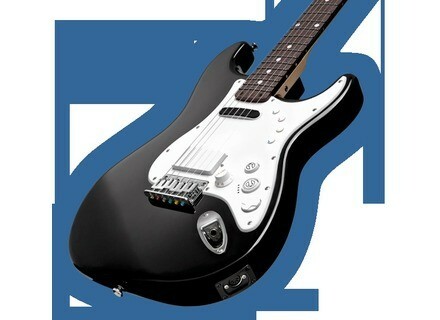 Fender recently announced an electric guitar that is also an officially licensed Rock Band 3 video game controller. 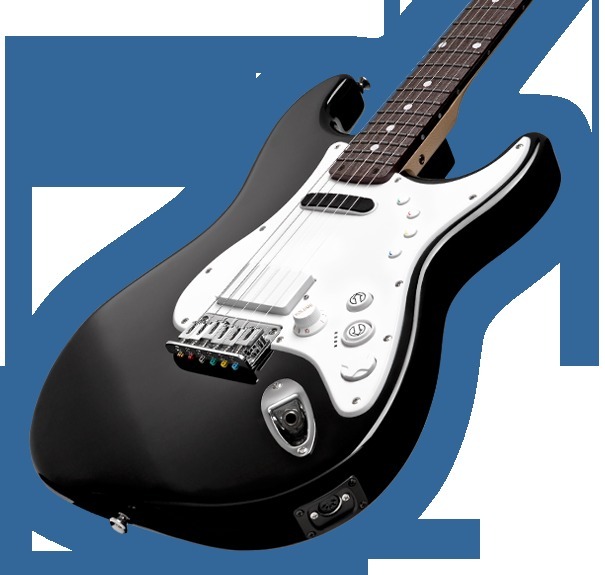 Designed exclusively for the Rock Band 3 Pro mode, the Squier by Fender Stratocaster Guitar and Controller allows players to play the actual notes and chords of the game's songs while racking up high gameplay scores. Its position-sensing fingerboard responds to the touch, turning gameplay into real musical performances. Gameplay requires the use of the Mad Catz MIDI Pro adapter (sold separately), compatible with the Nintendo Wii, Microsoft Xbox 360, and the Sony PlayStation 3. Features include an agathis wood body with polyester finish, 22-fret maple neck with polymer fingerboard and position-sensing electronics, enclosed tuners, custom bridge pickup, custom truss rod, hard-tail bridge, 1/4” output jack, standard five-pin MIDI output jack and Ableton Live Lite 8 recording software. Pre-orders begin on Jan. 1, 2011, with the instruments becoming available in retail outlets on March 1, 2011 at an MSRP of $279.99. For more information, go to www.fender.com/rockband3. [NAMM] Guild Standard Series Guild announces the debut of its new Standard Series Acoustic-Electric Cutaway guitars.